A SIM card is an essential yet the most familiar element of a cell phone. It was believed to be born at the same time as the mobile phones. A subscriber identification module, simply referred to as a SIM, is basically a smart card that essentially stores your phone’s information. It’s hard to imagine how the first SIM card developed in 1991 was the size of a credit card and how these chips have evolved over the years. Today, SIM cards come in several sizes, dictated by the form factor. The first form factor refers to the credit-card-sized card used in the first phase deployments back in the early 1990s, after that second iteration were deployed with approximately 2.5 × 1.5 cm in size. The SIM cards further evolved and so do the technology inside them. Now the SIM contains permanent records of the subscriber’s identity, and authentication algorithms. The benefits of today’s SIM cards include safety functions, interoperability with in principle any GSM phone and network, and the flexibility of adding and removing services. Additionally, SIM cards provide small memory for the users to store contacts and keep logs of calls and SMS. These cards come in varied sizes such as Mini, Micro, and Nano SIM cards. 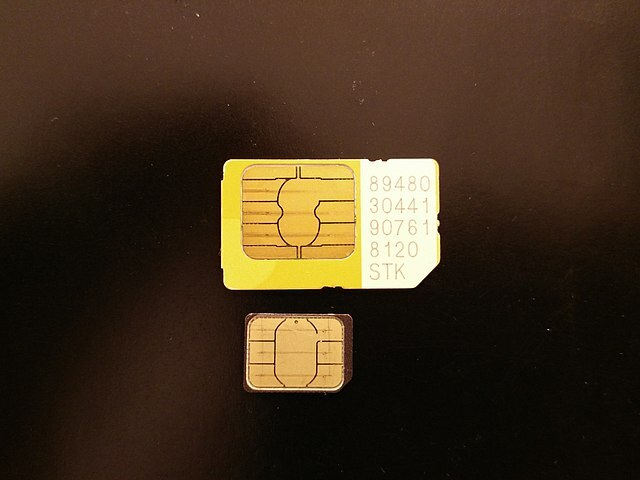 Now, SIM cards come in one size fits all, such that the Nano SIM can be taken from the Micro SIM, which may also be removed from the Regular SIM. The Micro SIM is the standard used by the high-end smartphones. It’s a smaller version of the Mini SIM cards with the extra plastic trimmed off around the circuit. It is often used in the smartphones manufactured from 2010 till today. Micro SIM cards are the third form factor (3FF) measuring only about 12mm × 15mm compared to the current SIM cards which measure 15 × 25 mm. When comparing a regular SIM and a Micro SIM card, the metal contact area, which is the working part of the SIM, is the same size in both. So, it is possible to cut a regular SIM card to the same shape and size as a Micro SIM, leaving the working area untouched. You’d then be able to use the trimmed SIM in your phone. Nano SIM cards are the smallest of all the SIM card specifications used in the latest and high-end smartphones. If Micro SIM cards the trimmed versions of Mini SIM cards, then Nano SIM is the cut-down version of the Micro SIM card specially designed to cut down on space in the new smartphones. The design is similar to the Micro SIM cards but Nano SIM cards are smaller and thinner than their Micro counterparts as well as the Mini SIM cards. Nano SIM cards measure 8.8mm in width, 12.3mm in height, and 0.67mm thickness. Like other SIM cards, Nano SIM consists of two parts of data storage – one part is used for system information and the other is used for user information which is secured by user PIN code. – The Micro SIM is the standard used by the high-end smartphones. It’s a smaller version of the Mini SIM cards with the extra plastic trimmed off around the circuit and is often used in the latest smartphones, mostly manufactured from 2010 till today. Nano SIM cards are the smallest of all the SIM card specifications used in the latest and high-end smartphones. If Micro SIM cards the trimmed versions of Mini SIM cards, then Nano SIM is the cut-down version of the Micro SIM card specially designed to cut down on space in the new smartphones. – Micro SIM cards are the third form factor (3FF) measuring only about 12mm × 15mm compared to the current SIM cards which measure 15 × 25 mm. A Micro SIM is noticeably smaller than a 2FF SIM, but larger than a Nano SIM, which, on the other hand, is the forth form factor (4FF) in the SIM specifications measuring only 8.8mm in width, 12.3mm in height, and 0.67mm in thickness. Nano SIM cards are the smallest of all SIM cards but hold the same amount of data as the earlier versions. In a nutshell, a SIM card contains permanent records of the subscriber’s identity used to identify his/her device on a network and Micro and Nano SIM cards the two most common SIM Specifications available today. 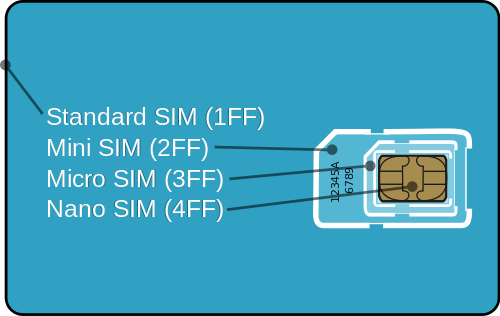 Micro SIM cards are the third form factor (3FF), whereas Nano SIM cards are the forth form factor (4FF) based on their sizes. Today, 3FF and 4FF dominate the cellular connectivity world. Nano SIM is the smallest of all SIM card specifications which measures only 8.8mm in width, 12.3mm in height, and 0.67mm in thickness. Micro SIM cards are the trimmed versions of the regular-sized Mini SIM cards measuring 12mm × 15mm with 0.76mm in thickness. Sagar Khillar. 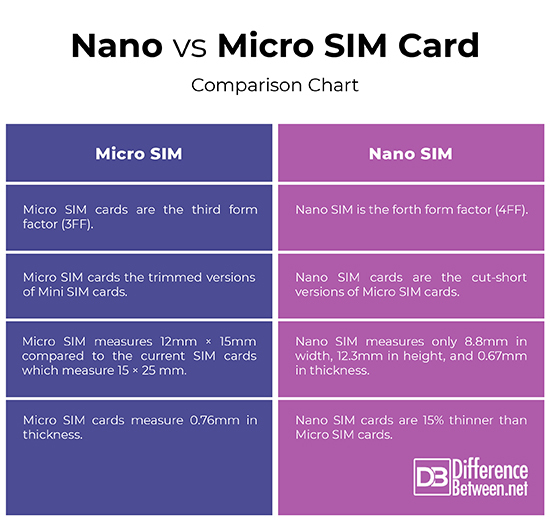 "Difference Between Nano and Micro SIM." DifferenceBetween.net. March 14, 2019 < http://www.differencebetween.net/technology/difference-between-nano-and-micro-sim/ >.